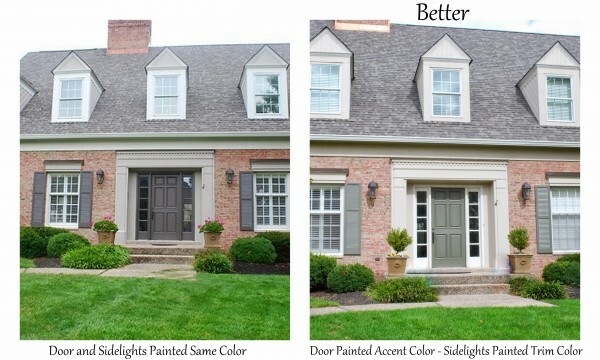 Besides choosing a front door color, I offered my advice about the paint color placement. I knew if I simply gave them a new color for the door, they would repaint the door, sidelights, and surrounding trim all the same color. And I don’t believe they should. 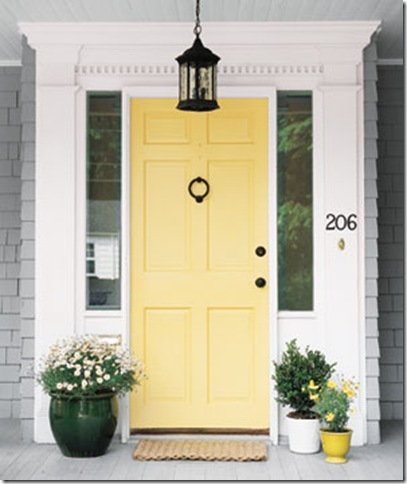 This entry was posted in Color Consultation and tagged choosing paint colors, front door, front door colors, front-door-and-sidelights, paint colors, paint-advice, should-sidelights-match-trim, sidelights-match-front-door. Love the colors you chose. Can you show after when completed? I do specify paint on non-wood doors frequently. Ask the specialist where you are purchasing paint as to which type of paint they recommend for exterior metal or non-natural material. Unfortunately, if you get a lot of direct sunlight there will be fading over time. But painting is easier to do on a semi-annual basis than refinishing wood, that’s for sure! I so agree, this makes such a better statement and looks great! Shld my side lights be trimmed in white to match my windows? Glad to know I got it right with my front door! I was thinking that rusty front door color was too harsh — the colors you chose seem perfect! Sometimes you can do a “random” accent color on a front door, but not in this case. 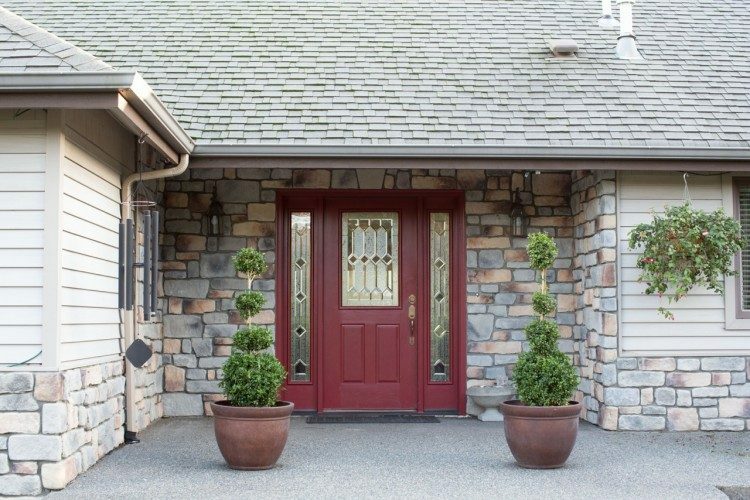 With bossy stone colors, if you don’t choose a door color that relates in some way (both that I chose look like darker versions of the stone undertones), it can definitely look “off.” Thanks for commenting! From what you describe, I doubt your front door color looks “random.” If it’s a new Victorian, I’m betting it’s siding without brick or stone. That’s the perfect place for a “random” or favorite color on the front door. Rookwood Sash Green is actually a Sherwin Williams color, and it’s stunning! The “random” front door can be a problem when you have busy brick or stone surrounding the door – that’s when the door color needs to relate in some way. I hope that makes sense! Great and timely post…..I’ve had numerous questions about this subject and your post really addresses this issue. Thanks! 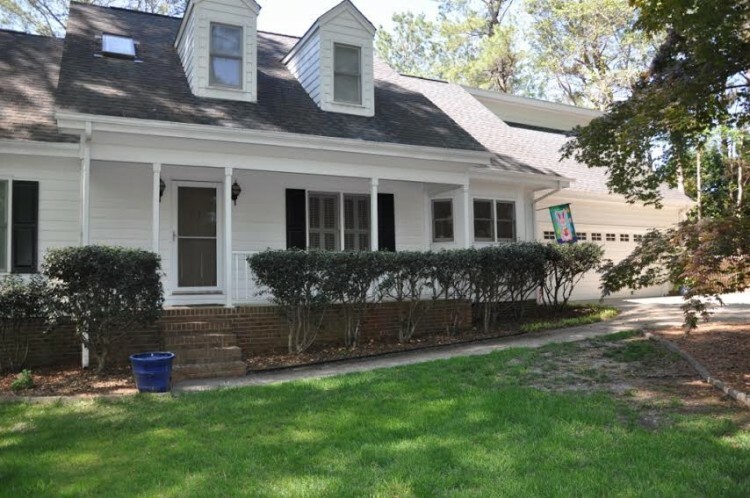 Can’t wait to see the “after” picture….I need ideas with my front door curb appeal too! Sent a note to Allison to see if there is any hope…lol. This was a great post to help me spruce up the front of my house. Thanks! Very timely article for me. I need to paint my front door, but hesitate because I don’t know what to do with the screen door. It is a full-glass screen door with a 4″ metal frame — do you paint the screen door the same color as the front door, or paint it the color of the sidelights? Thank you for this inspirational blog — I always learn something interesting. I usually recommend painting the screen the same color as the door – otherwise the door color is obstructed and looks choppy. Thanks for commenting and the great question! Hmmm… What if there is a sidelight only on one side? 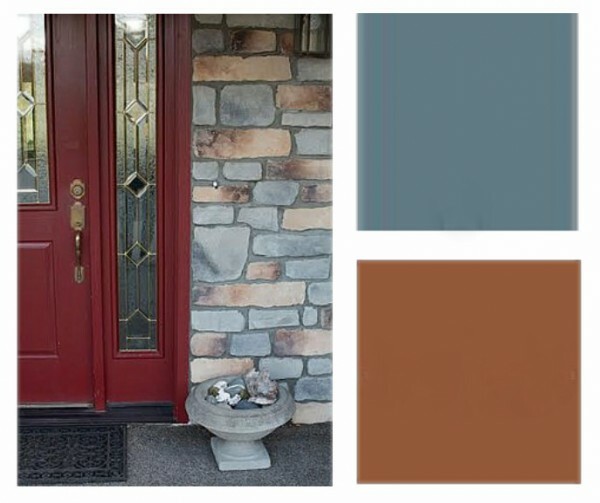 I have been wanting to paint my front door forever and can’t decide on a color. I am unclear on the single sidelight though, which is what I have. Are you suggesting if you have a single sidelight to paint it the same as the door? OMG! I lied. I have the double sidelights! I am losing it. My door is a dark green and the sidelights are white like the trim. My shutters are dark green too. Pretty boring. The house is mostly clay green. Haha! With double sidelights, I’d probably just paint the door a color and leave the sidelights white like the trim. I’m assuming the facade is clay green? I’d play around with a door color from another color family than green, but that complements those green shutters. Or why not paint the shutters a soft black and paint the door a more vivid green? Great advice. So many people question this. I love the blue color! So pretty! Thanks, Kristie, for such practical information. I have been dealing with this issue for my front door set and your post settled the issue for me! I don’t have sidelights, but find this post so interesting anyway. I do have a comment about painting the wood door and the storm door the same color. We did that recently. We bought the storm door in a color we love and then had paint made to match it exactly for the wood door. It looks wonderful, and the two doors read as one unit. I love it. Great post! Thanks, Cherie – and thanks for the input about painting the door and storm door the same, it really make a big difference! 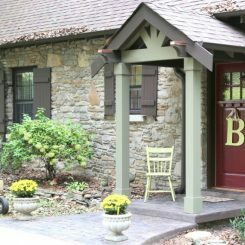 What’s the rule of thumb for front door color and shutters? We just moved into a red brick two story colonial (I guess). They took the shutters down and put up flower boxes on the second floor windows (4 in total). 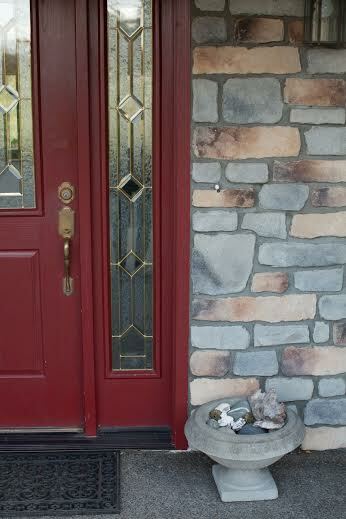 The front door is a “red brick” color with white trim and no sidelights. The storm door is the same color as the door. I would like to have shutters but don’t know what color they should be? I would be so greatful for any advice. It depends on a number of things (what doesn’t, right?) What color are the flower boxes? When dealing with shutters/door color on a brick house, it’s usually best to do one of them a “color” and one a “neutral” (like maybe black or almost black). And it depends on if it’s really red brick, or more of an orange/rust brick, which changes the colors I might recommend. The flower boxes are really baskets. Black wire with that potting insert. I’m pretty sure the brick is red. At least it has more red than orange. Looking across the street, I see homes with more orange in the brick. The door is like a burnt red not red red. I have pictures but don’t know how to upload them on this post. Thank you for replying so fast. The door is similar to the door you posted but brighter. Does that make sense? Kind of like a fall tree with red leaves and the sun shining on it. Ok, that’s proof right there that I’m terrible with color! I’d probably recommend black shutters if you have a red door – and the black would tie in well with the black wire baskets beneath. Just make sure you get shutters that are exactly half the size of the window it sits next to – nothing looks more cheapy than undersized shutters that wouldn’t close the window if they were actually shut (even if they never would). Thank you so much! That puts my mind at ease. Now I don’t have to worry about having to change the door color or not. I’ve learned a lot and will be following your website. Thanks again!!! I tried so hard to keep this concise and apologize a portion of it was duplicated. Just had a new front door installed. Have painted it wild blueberry and was concerned about the sidelights. I am planning to leave the sidelights white. The shutters are graphite which is almost black and the trim on the house is white. I hope I am making the right choice. Loved the comments. They are very helpful. Ann, I would leave the sidelights white to match your trim! Just had a new front door installed. Have painted it wild blueberry and was concerned about the sidelights. I think I will leave the sidelights white . The house is vinyl and is off white with graphite shutters (almost black). What is your feeling concerning the sidelights? Trim is white.